This post originally appeared on the Department of Commerce blog. This post contains external links. Please review our external linking policy. This is my favorite time of year, when we recognize the importance of Manufacturing as thousands of companies open their doors to welcome in the public to see the amazing products being made every day by our neighbors and friends in communities across the United States. 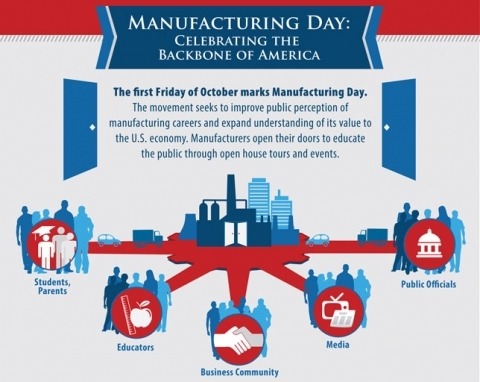 Manufacturing Day is October 2, 2015 and I am excited to be one of the many Americans who will spend the day touring some of the best manufacturing facilities in the world. There are currently over 12 million Americans producing the most innovative and advanced products in today’s marketplace and this is a time to showcase their inventive talents, as well as, inspire the next generation of manufacturers. Many companies will be hosting students of all ages so they can see for themselves the creativity that goes into producing everything from boats, to medical devices, to semiconductors in order to show that the manufacturing sector offers new and exciting career opportunities. For every $1 in goods produced, the manufacturing industry returns $1.37 to the economy. U.S. manufacturing industry is the 8th largest economy in the world. I have the great privilege of traveling the world promoting U.S. manufactured products and with 95% of the world living outside our borders, I am also excited to see so many of our products made here and shipped everywhere, to countries all around the world, contributing not only to the world economy, but to the health and productivity of citizens everywhere. In addition, manufacturing is the basis of a vibrant middle class. While manufacturing jobs continue to be high paying jobs, we are facing an upcoming shortage of skilled workers as 84% of manufacturers report a moderate to severe shortage of available, qualified workers. A recent Deloitte and Manufacturing Institute study estimates that by 2025, there will be 2 million jobs available in the U.S. Manufacturing sector. Manufacturing Day was created to help call attention to the importance and critical nature of a maintaining a healthy manufacturing workforce. We have always been a nation of makers and we will continue leading the world as the best place to manufacture the most innovative and highest quality products, built by the best workers. I encourage everyone to mark their calendar and use Manufacturing Day to tour one of your local manufacturers to see for yourself the unique products that are being made in your community. Thousands of open houses are listed on www.mfgday.com/events. Manufacturing is truly our future and we can all be a part of it.